The theme of an anti-hero confronting his personal demons through self-exploration and repeated failure is a familiar one: it requires little searching to find a book or film that represents any number of flawed (yet somewhat likable) characters as they bumble through a series of failing relationships, encounters with drugs and alcohol, reluctant parenthoods, destroyed friendships … to at last find a way to be a better man. Oliver Pepper’s Pickle, with its alcoholic, sexually stunted narrator, fits snugly into this compendium. Oliver Pepper’s decline and fall, and his subsequent recovery, is the basis of this humorous, sometimes rambling work of fiction by John C. Picardi. Oliver Pepper is a man who has become incapable of living his life. He is highly intelligent, and utterly wounded by his past. In the opening chapter, Pepper’s wife is leaving him, and it goes downhill from there. As she packs her things, she confesses to having a lover, to being stunted by their marriage, and to believing he is an alcoholic. Soon after, he discovers she engaged in a series of recurring, vigorous sexual encounters with his friends. Thus we meet our anti-hero Pepper, a young prep school professor with a drinking problem (that he denies even while drinking in his classrooms) and a total inability to emotionally relate to adult males, adult females, children, and a variety of daily occurrences. Indeed, soon he loses his job, winds up in AA, and discovers another frightful secret about his wife. When the book is not making you snicker, it will bite. At times Picardi moves through his plot material as if impatient to be through with it, before settling again on a scene and dialogue, yet overall, the book has a comfortable, compelling rhythm. It’s an interesting one-man study of how parents and childhood experiences can have an enduring affect on later lives, and how it’s possible for even the most distorted of human beings to find salvation in self-examination and hope for the future. 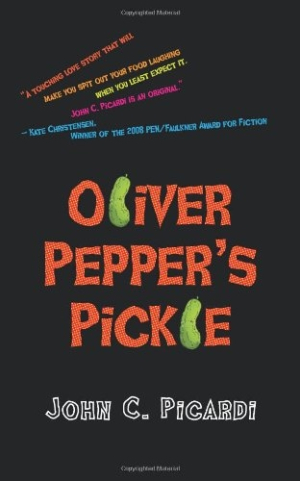 An amusing read, Oliver Pepper’s Pickle serves up both extremely light and extremely heavy moments until the very end.